Anyone who wants to conduct business as a money transmitter in Texas must obtain a license from the Texas Department of Banking (TX-DOB). To apply for a license, applicants must use the Nationwide Multistate Licensing System & Registry (NMLS) platform. During the application process, you will be required to comply with various licensing requirements. These include the submission of several forms, maintaining a certain amount of net worth, and posting a money transmitter surety bond. 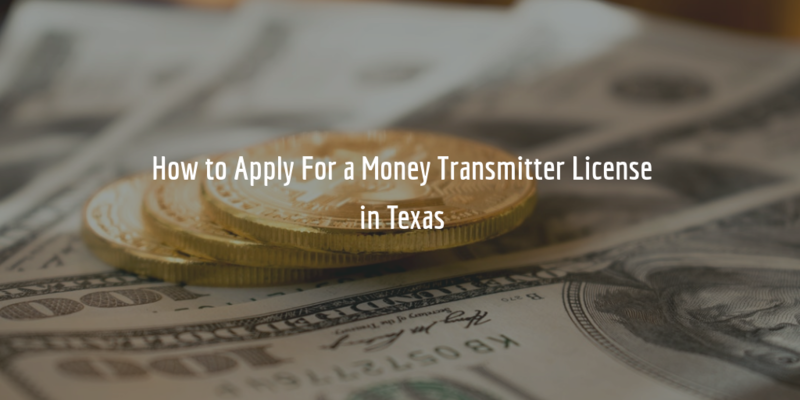 See the sections below for a step-by-step guide for getting a money transmitter license in Texas. Who Needs This Type of License? According to the Code, anyone who wishes to engage in any of these activities in Texas must obtain a money transmitter license. Before you can apply for your license, you first need to register at the NMLS website. Once you have access to your personal profile, you can begin with the application process. As you can see from the checklist provided by the NMLS, there are several different types of requirements you will need to cover. First, there are a number of forms you need to complete within the NMLS system itself. Second, there are some documents that you need to attach to your NMLS application online. Third, you must mail several additional documents by mail to the Texas Department of Banking. The following is a list of the forms and documents you need to complete and submit through the NMLS. Below them, you can find an additional list of the items you need to mail directly to the TX-DOB. Finally, you must pay a $10,000 filing fee upon submitting your application. Pay great attention to the requirements for your submission, because your application may be returned if it is not completed correctly. Once you’ve submitted your application, you can expect to hear from the DOB within a few weeks time about the issuance of your money transmitter license. Applicants for this type of license must post a surety bond as part of their application. The amount of the bond must be the greater of $300,000 or 1% of the transmitter’s total yearly dollar volume of transmission in Texas or the projected amount for the first year (for first-time applicants). The maximum amount of this bond is set to be $2,000,000. The amount of your bond is not the same as the cost of your bond. The cost of your bond is determined by the surety when you apply. It is primarily based on your personal credit score . Want to know how much your bond will cost? Complete our bond form below and we will provide you with a free and exact quote on your bond.